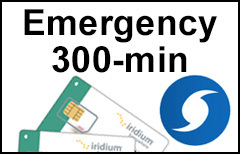 The Iridium Emergency 300-min Plan offers a lower start-up cost for individuals and organizations who need satellite communications only for emergency or occasional use. For an annual fee of $678 ($56/month), you will receive a one-year subscription to Iridium satellite service with 300 bundled minutes. No monthly fees, no additional charges, no credit checks, no security deposits! The plan can be used with any Iridium phone anywhere in the world. After expiration the Iridium account can be extended by loading other vouchers.